The old Shockley House is a legendary place, although it had fallen into neglect for decades. 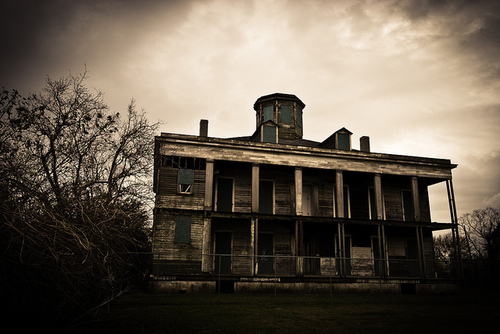 The old manor home was in dire need of restoration and appeared a creepy husk of its former glory. Of course, I knew some of the legends about the place: it was an old sanitarium, Doc Holliday had convalesced there in his latter consumptive days, in later years in had become a home for mental patients who had nowhere else to go, and finally, it was haunted. As I sat gazing at the faded, cracked walls and foreboding gothic architecture with its columned façade and lone octagonal turret, I could plainly see why the legend of it being haunted applied. While I didn’t believe that particular legend myself, it was obvious that this old home fit the stereotypical description of a haunted house and anyone who believed such pseudoscientific silliness would readily gravitate to such conclusions. Of course, Matt had brought me to this place for a very calculated reason and he soon began to tell me the story of the house. Towards the end of the Civil War, Dr. Charles Brice Shockley built the house initially as his retirement residence. 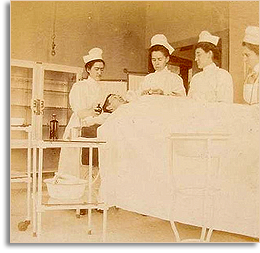 The elder doctor was too restless in his retirement to putter about the house and soon transformed the manor into a sanitarium for the then prevalent Tuberculosis patients who struggled through the disease with little to no effective treatments. In the parlance of the day, these people were said to suffer from “consumption”. Shockley House remained in the Shockley family for the next four decades and was largely operated as a sort of resort or spa for most of that time. Just after the turn of the century it was then purchased by Dr. Calvin S. Moody, the forebear of Matt Remy; and the reason why Matt had brought me here began to become a bit more coherent. But there was yet more to the story before I finally understood what he wanted my role to be in his fantastic scheme. 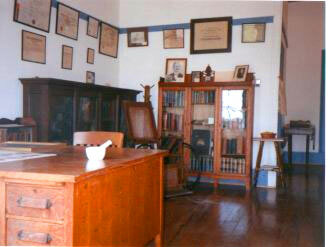 Dr. Moody had refurbished the manor to create his in-patient mental hospital as the locus of his research. My knowledge of Dr. Moody’s work at this time was what the current psychological literature commonly taught; he was one of the prominent champions in the 30’s and 40’s of using psychotropic drugs instead of the more traumatic or invasive techniques such as shock therapy and lobotomy that were widely used by numerous professionals and colleagues of his day. These practices are considered barbaric by today’s standards, but it was not so long ago that they were considered legitimate, scientific treatments for mental maladies. And then Matt told me this: “Shockley House has passed through the family into my possession. I’ve planned on renovating it for many years, but I just can’t bring myself to commit to it. You see, Keith, there’s something historic and romantic about it the way it is. I find a certain air of mystery surrounding it; like it’s still got more secrets to discover. Modernizing it would destroy my chance at finding them, I should think. My gaze followed his pointing finger up to the octagonal tower that dominated the top of Shockley House. We made our way up the overgrown path and up the creaking, worn stairs. As Matt rummaged through a key ring searching for the right key to unlock the front door, I marveled at the state of the structure. It was sad, in a way, to behold this fantastic specimen of gothic architecture in such a neglected state. The paint was flaking to the point that the bare wood was as prominent as the painted portion. One had to carefully navigate the steps and porch for fear of treading upon a rotten section of wood that would surely give way underfoot. Matt succeeded in finding the right key and we were soon inside. I was surprised to find the electricity was working as Matt proceeded to flip on switches as he led us through the front hall and several rooms. I had to keep up but wanted to pause and explore each room. The dust was thick and most furniture was covered with sheets that were also caked in films of dust and cobwebs. The walls still held pictures and décor that had probably been in place since the early part of the 20th Century. Following Matt, we soon entered the old office of Dr. Moody. It appeared as it must have appeared in his day except bereft of any cleaning. There was a large wooden desk with papers, paper weights, a name placard and a mortar and pestle upon it. The walls were covered in diplomas, certificates, and pictures. Several book cases lined the walls, each filled with text books, reference books, and random medical devices. On one wall was a large, sitting-couch and recliner. “Categorization scheme?” I asked confused.